The weather and the economy are both volatile, of late, with the aptly-named Hurricane Michael (‘who is like God’) smashing into the Florida panhandle, the largest storm in a half-century, or a century, depending on whom you read. Our capacity to measure such things as a storm’s ‘strength’ has, I am sure, become more accurate over the years, but not so our ability to control, direct, to say nothing of stop, them. That is in the hands of God. The same goes for the complex system we call the ‘stock market’, on which so much of our economy depends, for good or ill, mostly for ill, I would think. Most of us have no idea how it really works and, as with all complex systems, a small glitch can spiral the whole thing into chaos. It seems this time, according to some analysts, along with President Trump, that the current free-fall was prompted by an increase in the interest rates by the Federal Reserve, a private corporation that controls the money supply and other factors. Like the causes of a hurricane and, while we’re at it, the current scandals in the Church, the aetiology of these things is all very dark and mysterious. 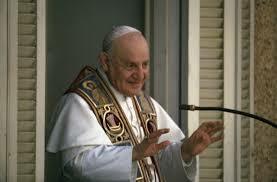 But the light shines in the darkness, and we should adopt some of the optimism of Pope Saint John XXIII, whom we commemorate today, the anniversary of the beginning of the Second Vatican Council, for which he is most remembered. Yes, the good Pope is derided in some traditionalist circles for calling the Council, apparently out of the blue, which, in their minds, caused all the problems in the modern Church, a case of the logical fallacy of post hoc, ergo propter hoc. The causes of the Church’s current malaise are not easy to discern, but the Council, whose words, if not formulated in clear, scholastic language, are all orthodox and timely, if read rightly (part of which is reading the documents in the original Latin, for the translations are all to some degree imperfect and a bit tendentious). Pope John had hope, in the supernatural sense, that, even in the midst of pain, suffering and confusion, God is always in charge, overseeing all things in His all-encompassing and merciful providence. He was, correspondingly, a pious man in the full sense of that term, devoted to Christ, Our Lady, the Church, and one who, for all his portly appearance, lived a holy and ascetic life. He was also conservative, and may well have been displeased with much of what followed the Council, more in line with a dubious ‘spirit’ than the actual text. The hermeneutic of rupture, as Pope Benedict would later aver, is all too evident more often than the hermeneutic of continuity. Was he, along with so many others in those heady years of the sixties, too optimistic? Perhaps. But we should also remind ourselves that amongst Pope John’s last writings was an encyclical, Paenitentiam Agere, exhorting the need for prayer and penance in the life of every Christian, and the Apostolic Constitution, Veterum Sapientia, on the enduring value of Latin, in the liturgy, seminaries and schools. The latter document is available, aptly enough, only in Latin on the Vatican webpage. (For an English version, for those of us who, for various reasons usually out of our control, have not taken Pope John’s exhortation fully to heart, see here). Guiseppe Roncalli was not a modernist, nor a laxist, nor even an innovator. His diary, Journal of a Soul, still widely read, evinces, from his earliest years, his desire for and gradual ascent to holiness, through a prayerful and disciplined life, with daily small victories over ‘self’. He was steeped in Tradition, yet saw the need to open the Church’s truth, along with all her means of holiness, to the world. His long and varied life ended soon after the Council was called, and we know that he is interceding for us and for the Church from heaven. It is reported he would say before retiring each evening, ‘It’s your Church God; take care of it while I rest’. Like the good Pope, we should not suffer from anxiety; rather, we can only do our duty, and leave the rest to the Father.